Having officially reached lunar orbit on June 23nd, 2009, the Lunar Reconnaissance Orbiter (LRO) has now marked one full year on its mission to scout the moon. Maps and datasets collected by LRO's state-of-the-art instruments will form the foundation for all future lunar exploration plans, as well as be critical to scientists working to better understand the moon and its environment. In only the first year of the mission, LRO has gathered more digital information than any previous planetary mission in history. To celebrate one year in orbit, here are ten cool things already observed by LRO. Note that the stories here are just a small sample of what the LRO team has released and barely touch on the major scientific accomplishments of the mission. If you like these, visit the official LRO web site at www.nasa.gov/LRO to find out even more! One of LRO's observations from the past year goes beyond cool to absolutely frigid. Diviner, LRO's temperature instrument, found a place in the floor of the moon's Hermite Crater that was detected to be -415 degrees Fahrenheit (-248 Celsius) making it the coldest temperature measured anywhere in the solar system. For comparison, scientists believe that Pluto's surface only gets down to about -300 degrees Fahrenheit (-184 Celsius). Extremely cold regions similar to the one in Hermite Crater were found at the bottoms of several permanently shaded craters at the lunar south pole and were measured in the depths of winter night. On July 20, 1969, NASA added a page to the history books when Apollo 11 astronauts Neil Armstrong and Buzz Aldrin were the first humans to set foot on the moon. Though their stay was only brief, Armstrong and Aldrin had about two and a half hours to track around outside the module, taking pictures and deploying a few science experiments before returning to orbit and ultimately, the safety of Earth. Images of the Apollo 11 landing site from LRO clearly show where the descent stage (about 12 feet in diameter) was left behind as well as the astronauts' tracks and the various equipment they deployed. This LRO data has important scientific value, as it provides context for the returned Apollo samples. Beyond their use for science, the images of all six manned landing sites observed by LRO provide a reminder of NASA's proud legacy of exploration and a note of inspiration about what humans are capable of in the future. While all of the Apollo missions are fascinating, the Apollo 14 activities provided a particularly interesting story to see in the images from LRO. The mission called for Alan Shepard and Edgar Mitchell to go to Fra Maura where they would attempt to gather samples from the rim of Cone Crater. Without having the aid of the lunar rover and having to drag a cart full of scientific equipment along with them, the trek from the descent module to Cone Crater proved to be a physically intense one. After traversing nearly a mile (1400 meters), the steep incline of the crater rim, the high heart rates of the astronauts and the tight schedule of the activity resulted in mission control ordering them to gather whatever samples they could and return to the landing module. They never reached the edge of the crater. Though geologists say it did not greatly affect the success of the scientific goal, the astronauts were personally disappointed in failing to make it to the top. Images from LRO now show precisely just how far the astronauts traveled and how close they came to reaching the crater, their tracks ending only about 100 feet (30 meters) from the rim! Apollo 14 Lunar Surface Journal Mission Summary. Lunokhod 1 was the name of a Russian robotic rover that landed on the moon in 1970 and navigated about 6 miles (10 km) of the lunar surface over 10 months before it lost contact in September 1971. Scientists were unsure of the rover's whereabouts, though at least one team of researchers were searching for it, hoping to bounce a laser off of its retroreflector mirrors. This past March however, the LROC team announced they had spotted it, miles from the location the laser team had been searching. Using the info provided by LRO, a laser pulse was sent to Lunokhod 1 and contact was made with the rover for the first time in nearly four decades. Not only did Lunokhod 1's retroreflector return a signal, but it returned one that was about five times better than those that have routinely been returned by Lunokhod 2's mirrors over the years. Tidal forces between the moon and the Earth have slowed the moon's rotation so that one side of the moon always faces toward our planet. Though sometimes improperly referred to as the "dark side of the moon," it should correctly be referred to as the "far side of the moon" since it receives just as much sunlight as the side that faces us. The dark side of the moon should refer to whatever hemisphere isn't lit at a given time. Though several spacecraft have imaged the far side of the moon since then, LRO is providing new details about the entire half of the moon that is obscured from Earth. The lunar far side is rougher and has many more craters than the near side, so quite a few of the most fascinating lunar features are located there, including one of the largest known impact craters in the solar system, the South Pole-Aitken Basin. The image highlighted here shows the moon's topography from LRO's LOLA instruments with the highest elevations up above 20,000 feet in red and the lowest areas down below -20,000 feet in blue. The LRO Camera (LROC) has a resolution about ten times better than any previous lunar orbiter missions. That means for every pixel imaged by other spacecraft, LROC gathers 100 pixels in that same area, enough to distinguish details never before possible. One of the most striking ways this manifests itself is in the ability to make out detailed craters and individual boulders, some no larger than a few feet on the lunar surface. In order to understand the history of the lunar surface and its features and mechanisms, scientists look at the abundance, size, shape, and distribution of both craters and boulders. By comparing and analyzing these feature counts across different regions as well as other places like the Earth and Mars, we can gain a better understanding of our solar system's natural history. With the increased resolution of the LRO Camera as well as the new information gathered by LRO's other instruments, scientists can characterize the moon's surface in ways never before possible. This information will be critical for both science and future exploration plans. Not only that, but now thanks to the "Moon Zoo" (http://www.moonzoo.org) the public can get involved doing their own crater and boulder counts to aid in the research. With hundreds of gigabytes of new data returning daily, the contribution of "citizen scientists" can play a crucial part in lunar science. On the Earth, we are taught that mountains form over millions of years, the result of gradual shifting and colliding plates. On the moon however, the situation is quite different. Even the largest lunar mountains were formed in minutes or less as asteroids and comets slammed into the surface at tremendous velocities, displacing and uplifting enough crust to create peaks that easily rival those found on Earth. On a few occasions in the past year, NASA has tilted the angle of LRO to do calibrations and other tests. In such cases the camera has the opportunity to gather oblique images of the lunar surface like the one featured here of Cabeus Crater providing a dramatic view of the moon's mountainous terrain. Cabeus Crater is located near the lunar south pole and contains the site of the LCROSS mission's impact. Early measurements by several instruments on LRO were used to guide the decision to send LCROSS to Cabeus. During the LCROSS impact LRO was carefully positioned to observe both the gas cloud generated in the impact, as well as the heating at the impact site. LRO has now collected the most detailed images yet of at least two lunar pits, quite literally giant holes in the moon. Scientists believe these holes are actually skylights that form when the ceiling of a subterranean lava tube collapses, possibly due to a meteorite impact punching its way through. One of these skylights, the Marius Hills pit, was observed multiple times by the Japanese SELENE/Kaguya research team. With a diameter of about 213 feet (65 meters) and an estimated depth of 260 to 290 feet (80 to 88 meters) it's a pit big enough to fit the White House completely inside. The image featured here is the Mare Ingenii pit. This hole is almost twice the size of the one in the Marius Hills and most surprisingly is found in an area with relatively few volcanic features. To celebrate one year in orbit, here are ten cool things already observed by NASA's Lunar Reconnaissance Orbiter. Note that the stories here are just a small sample of what the LRO team has released and barely touch on the major scientific accomplishments of the mission. 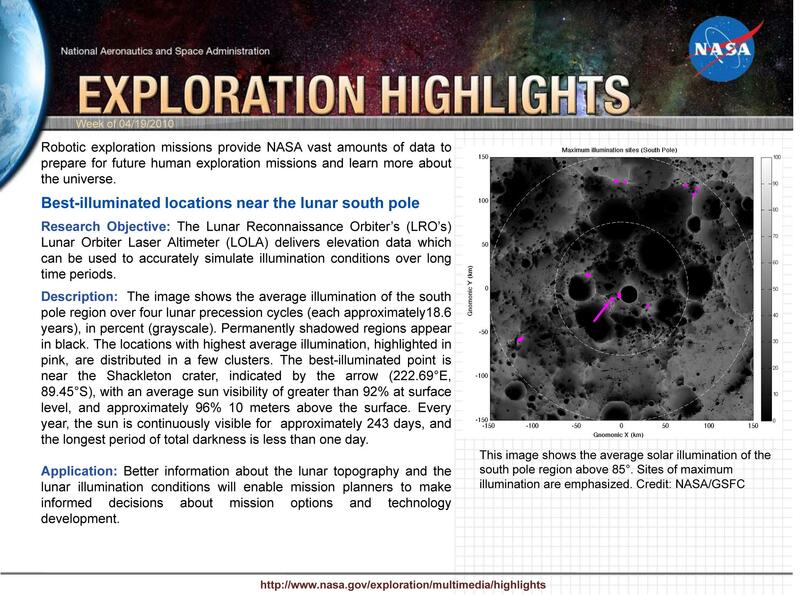 Visit www.nasa.gov/LRO to read about these images and many more!